As you know, Wm. 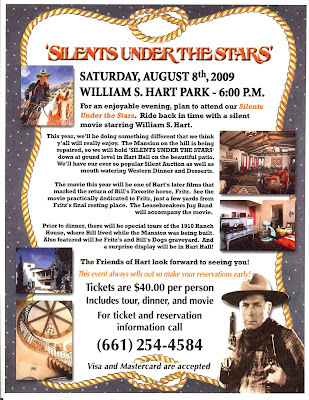 S. Hart Park is one of the oldest and most important attractions we have in Santa Clarita. Each year thousands of school children and members of our community tour the mansion and park grounds free of charge. This event supports the park and its herds of buffalo and deer, the farm animal zoo in addition to other park attractions. This year we will be holding the event at Hart Hall with it’s fantastic garden setting. Dinner will be served on the patio and the silent movie Sand will be shown. Sand features Bill’s favorite horse Fritz in a fast riding, leaping from cliffs into the river, train robbing and the winning of the sweetheart in the end, silent movie accompanied live by the Leasebreakers Jug Band! Tours will be given of the Ranch House and the new animal exhibit. Built in 1910 the Ranch House was sometimes used as a location for Hart’s films. Now the Ranch House showcases original furnishings, memorabilia and riding equipment used in his movies. From 1921 to 1924, before La Loma de Los Vientos (the mansion) was completed, Hart and his sister Mary Ellen sometimes stayed at the Ranch House. The new animal exhibit includes turkeys, chickens, pigs, cows, mules, ducks and geese. The new exhibit enclosures where just completed last month and this is an opportunity to see the newest addition to the park. The silent auction will feature a Caribbean vacation, two nights at Harrah’s Laughlin, tickets for the following: Pat Benetar at COC, Disneyland, Magic Mtn., Clippers, Universal Studios. Gift baskets include Paula Deen, Barefoot Contessa, Cesar Milan and many others. Also gift certificates to many local restaurants including Salt Creek and Don Cuco’s.